I went to an estate sale yesterday, just to have a look around. I wish I had brought my camera, because the house was so beautiful. Not beautiful as in perfectly decorated and lovingly kept, but beautiful as in "oh, this is my dream renovation house!" It was a small nineteenth-century farmhouse, which looked as though it may have been the caretaker's house for some great estate. It was painted white with black shutters and a red door -- that almost iconic scheme for old houses here in the northeast. Just inside the front door was a small central hall, painted with a beautiful scene of the rolling green hills that this area is famous for. The hall led straight back to a sitting room with the most gorgeous old wainscoting and huge hearth. All the floors were wide-board pumpkin pine -- to die for! There was even a big sunroom at the back of the house -- definitely a more recent addition but beautifully scaled and executed. Of all the people who were at the sale while I was there, I think every single one of us asked the same question: "Is the house for sale?" Mary, I do love the shiny and the old too! What a find! I would love to go to an estate sale someday. I would have bought the spoon and plate too. Oh, you could be Martha Stewart!=] (she fixed up her old pumpkin floors.) Oh, that house sounds absolutely PERFECT! Painted hall, wainscoting, large hearth and a sun room. Oh, it's so fun to dream but, then, I bet you people dream about our houses, too. I loved your last post. Well said! I LOVE your Autumn decorations, too!!!!! It's just beautiful! Love to you and your family and have a happy weekend! Mary, I loved this story! What is pumpkin pine? On another note ~ I'm having company tomorrow and the place is an absolute mess. I wish I could just hire a cleaning crew. I apparently have the same proclivity for shiny things — I just went to the Fall Festival and now seem to possess yet more jewelry... one can never have too many shiny things! The house sounds charming! Nice find at the estate sale. How does one set up a mosaic? I've been to a sale before too where the home is beautiful or you know it could be with a little work. The spoon is gorgeous, the plate too! Beautiful spoon - think I would have had to buy it also. I love seeing old houses like that.Have a great weekend. Magpies Anonymous indeed! From one who did not intend to go to the auction last night, but did, did not intend to buy anything.........but of course I did! (its a good thing 'your' thrift shop is nowhere near me! Before I got so darn old, I used to love going to estate sales and big home auctions. Now the standing and waiting is just a bit too hard on the body. I, too, need to get my act together and think about my Monday post. Sounds like a wonderful house, have not been to an estate sale in years. Lovely spoon. 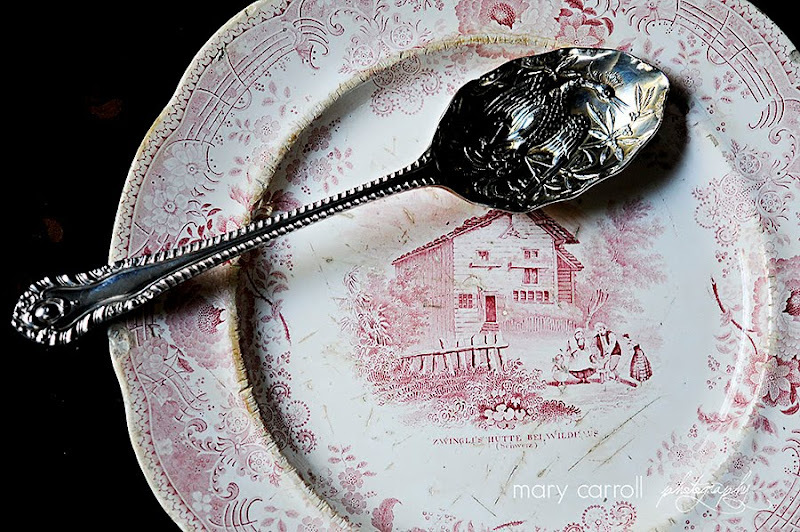 Mary, I love old spoons, too. I keep a pitcher of them on my table and a pot of them on the counter. Old silver. I like to think about who may have used them in the past. Mary, I adore the spoon you purchased and I'm so glad you pictured it on the plate which gives an idea of approximate size. I inherited 2 similar spoons from my aunt and I believe they are called berry spoons. I don't know if they are to be used as a pair (as you would to serve a salad). The spoon's chased bowl would be more efficient serving blueberries but not huge strawberries! The spoon is really very elegant, isn't it? I too think it looks like a berry spoon. Estate sales are pretty much unknown up here, and I miss them - the adventure, the opportunity to see a beautiful old house and perhaps take some inspiration from its decoration. Thanks for taking us with you and giving us such a lovely word picture of what you saw. Sweet Husband and I actually got together over a spoon, so I'm partial to them. And that's an especially pretty one! Could that spoon be what they call Repousse'??? I know holloware pieces are sometimes called that. The house sounds lovely, but NOTHING could be anywhere close to as lovely as yours!!!!! !